On the day before the conference, an introduction seminar to mechanical and biological waste treatment (MBT) in English is available. On the three conference days there will be continuous simultaneous translation provided. 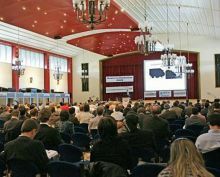 Hence, it will be possible to hear and discuss all those presentations in English, French and German. Participants from 41 countries made use of it at the previous event in 2017.